Ali Ibrahim, a second-year Human Rights and Human Diversity student at Wilfrid Laurier University’s Brantford campus, was just 11 when his family fled their home in Somalia and settled in a refugee camp in Kenya. It was at this refugee camp that Ibrahim was raised and educated. “I dreamt of getting a university education, but I didn't know where that education was going to be. I just worked hard, I set up goals, and I was working towards those goals in achieving good grades,” he said. During his early days of schooling, Ibrahim discovered the World University Service of Canada (WUSC) Student Refugee Program, which launched in 1978 to combine resettlement with opportunities for higher education for refugees. WUSC eventually led Ibrahim to Laurier in 2017. "When my friends would say ‘Ibrahim, why are you studying?’ I would say, ‘I have dreams, my friend.’ I want my dreams to become a reality." The WUSC program at Laurier began in 1985, with the first refugee students arriving in 1991. Laurier’s Brantford campus has been accepting WUSC refugee students every year since 2011 through a special levy of $4 per student per semester, which covers tuition and living expenses for the students. Laurier’s Brantford and Waterloo campuses have WUSC local committees that help the refugee students throughout their university careers, providing a circle of peer support to help the students navigate life in Canada. The local committees help the students with tasks like setting up a bank account, obtaining a Social Insurance Number, and cold-weather preparation. They also help students acclimate to daily tasks in their new country by accompanying them on grocery-shopping trips and providing guidance on how to use the public transit system. “It’s a long list of administrative things that the refugee students have to do, so the WUSC local committee supports the students to adapt to life on campus,” said Mike Boylan, global engagement programming coordinator with Laurier International. 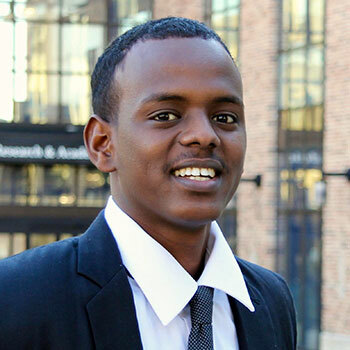 Ibrahim was accepted as a student in 2017. Now, he spends his time studying and welcoming new students through the multiple clubs he volunteers with at Laurier. Ibrahim’s family left Somalia due to internal conflict in the country. He was young, and recalls that he didn’t know about refugee camps at the time. He only understood that they were going somewhere that promised to be more peaceful. He remembers that the hot, dusty weather and living conditions were difficult. “Life in a refugee camp is very challenging in reality, but I had my family, my friends,” he said. "For the price of a latte per term, as a collective, they can have this impact for these individuals that come here to study. It's pretty significant." Education was his beacon. For Ibrahim, the only opportunity to get out of the refugee camp was through resettlement or education. He said the resettlement process is a slow program with a low chance of acceptance. But he knew that if he worked hard, he could go to university in Canada. Ibrahim’s family is still in the refugee camp in Kenya, but he speaks with them as often as possible. “They always say to me, ‘don't forget to work hard in school, because that's the only way you got out of this camp. Still strive to excel, work hard, that's the only way you can succeed in life,’” he said. During his first year as a new student at Laurier and in Canada, Ibrahim saw the importance of getting involved outside of the classroom. “I started applying to clubs at the end of my first year. I didn't know which clubs I would get accepted to, so I just applied. All of them accepted me,” he said, laughing. He was an icebreaker during Orientation Week, welcoming new students to campus. He is also part of the WUSC local committee, Global Engagement Student Ambassadors, Human Rights and Human Diversity Students’ Association and Muslim Students’ Association. Ibrahim found that everyone at Laurier – professors, staff and students – were all helpful to him in his first year, so he wanted to be that person to someone new. Boylan said the WUSC program is one of the simplest but most meaningful ways that Laurier students can make a difference, with the levy literally changing the course of individuals’ lives. “For the price of a latte per term, as a collective, they can have this impact for these individuals that come here to study. It's pretty significant,” he said. The student refugee program is also supported by the Wilfrid Laurier University Faculty Association and the Office of the President. “The student refugee program is huge; it's very inspiring and because the whole university, whether they know about it or not, they are contributing to it and they should feel a little bit of pride in the outcomes of it,” said Boylan. Laurier International is celebrating International Education Week from Nov. 12 to 16. This week of celebration offers students a diversity of the programs, events and activities. For a schedule of events, visit Laurier International.